How do Rheumatoid Arthritis clinical trials work? Clinical trials are research studies that test medications, devices, or procedures that may be used to treat a disease. Sometimes already approved medications are also tested in new ways. Rheumatoid Arthritis clinical trials not only help to create new treatments, but also help develop better ways of managing the disease. In the United States, the Food and Drug Administration (FDA) only approves new drugs (or new uses for existing drugs) after three phases of clinical trials. The FDA regulates clinical trials and requires specific monitoring during the trials. In Europe, the European Medicines Agency (EMA) regulates clinical trials and new drug applications. Could Rheumatoid Arthritis clinical trials be an option for you? There is a lot to consider before joining a clinical trial. I have participated in a trial before, so I understand there are many questions. But it can also be good to learn about new medicines that are being tested or might become available soon. 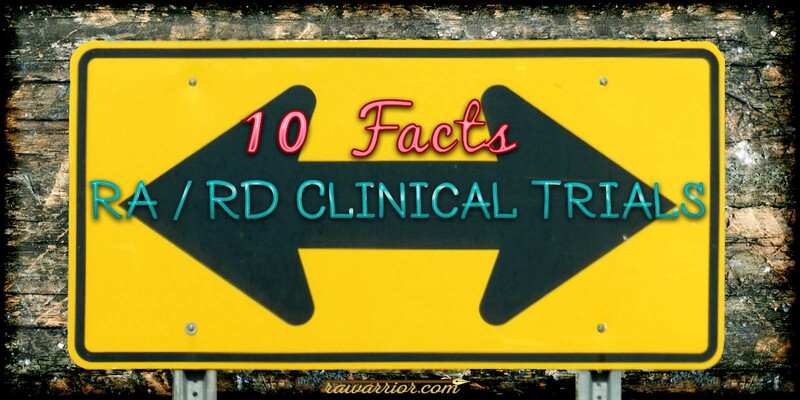 Here are 10 facts to get you started learning more about clinical trials for RA. 1) Clinical trials can be a way to expand treatment options. People with Rheumatoid Disease (PRD) who need more options may be able to try a new drug or even an already approved drug as it is further studied. 2) New drugs tested in Phase III Rheumatoid Arthritis clinical trials have already been determined to be generally safe in healthy volunteers (Phase I). They have also been tested for safety and effectiveness in a small group of patients (Phase II). 3) You may get free medical care in Rheumatoid Arthritis clinical trials, or even be paid to participate. It is even possible to receive a higher level of care in a clinical trial setting, with state of the art disease assessment and close monitoring for possible side effects. 4) Specific study rules for the clinical trial may define specific activities. Such protocols may specify which days you must have blood tests or other appointments. In Rheumatoid Arthritis clinical trials, the protocol usually includes what doses can be used of other medications, such as prednisone. 5) Qualifying interviews are conducted first. If a PRD meets basic qualifications in a brief interview, then before being included in a clinical trial, she or he may answer a detailed questionnaire, have a physical exam, and release other medical records. 6) Rheumatoid Arthritis clinical trials have specific requirements called “inclusion criteria.” These may relate to age, gender, or comorbidities. Sometimes, qualifications include symptoms or blood test results. Often, people are included or excluded in Rheumatoid Arthritis clinical trials based on medications taken now or in the past. 7) You may sign a stack of pages in a process called “Informed Consent.” However, this does not take away any of your rights to be treated properly. If it becomes necessary, you can always withdraw from the trial. 8) Health information is protected by HIPAA in the U.S. Patient information is de-identified prior to publication of any research. 9) You may help other patients. While it should not be the only reason to participate in Rheumatoid Arthritis clinical trials, knowing that one is helping future generations of PRD can be satisfying. 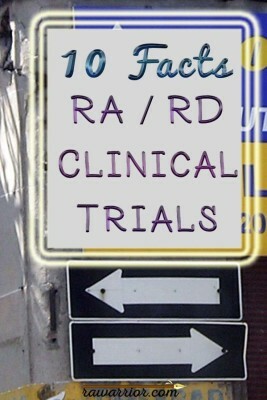 10) Tools can make it easier explore rheumatoid arthritis clinical trials. The U.S. National Institutes of Health is working to improve its difficult to navigate ClinicalTrials.gov site, but modern widgets like this one from Antidote make searching much easier. HAVE YOU EVER THOUGHT OF JOINING A CLINICAL TRIAL OR BEEN IN AN RA CLINICAL TRIAL? WHAT IS YOUR BIGGEST QUESTION ABOUT CLINICAL TRIALS? NOTE: Please don’t forget to sign the White House petition – click here. What you dont say is that it could lead to your death – refer to the contract that I signed for biological medicine. Yes and I nearly died. I cancelled the contract. Nobody after my cancellation did any body tried to find out how I am. Thanks but never again – you are just a gimme pig! Nice post! I wish I could take part in clinical trial, but unfortunately I am thousand miles away from the US or EU. Thank you so much for sharing, it is a lot of new information for me, because I am still 20 years old and just knew that I was diagnosed RA. May God bless you!. I think it is really great that you have summarised the positive aspects of taking part in a clinical trial. These are all points we stress in my department in a UK National Health Service hospital. Our patients have limited access to “biological” treatments and we may have to offer them in a specific sequence. Many hospitals can only use a total of 3 biologics in any one patient for NHS treatment. With clinical studies the doctor gets some flexibility too.